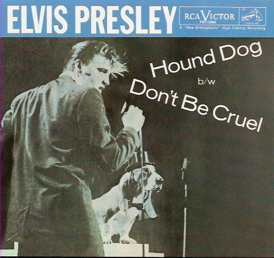 "Hound Dog" & "Don't Be Cruel"
The history of Presley’s phenomenal dual record began on July 2, 1956, when Elvis entered RCA’s studios in New York City to record two songs for his next single release. 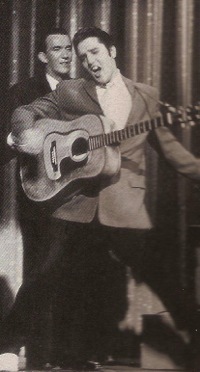 Accompanying Presley were the Jordanaires and musicians Scotty Moore (guitar), Bill Black (bass), D. J. Fontana (drums), and Shorty Long (piano). Going in, “Hound Dog” was the only title on the schedule. 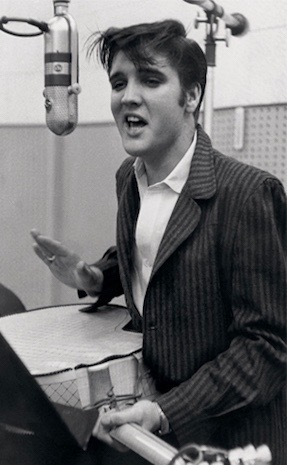 Elvis’s controversial performances of the song on the June 5th Milton Bearle Show and the July 1st Steve Allen Show had created a public demand for its release on record. The "Hound Dog" / "Don't Be Cruel" single was quickly pressed and shipped to dealers beginning on July 13. A Wertheimer photo of Elvis singing to a hound dog on the Steve Allen Show appeared on the record’s picture sleeve. The flap caused by Presley’s TV performances of “Hound Dog” dictated its designation as the “A” side of RCA Victor single release #6604. “Hound Dog” was the first of the two sides to hit Billboard’s Top 100 chart when it entered at #24 on August 4. The next week it was up to #11, with “Don’t Be Cruel” first charting that same week at #28. 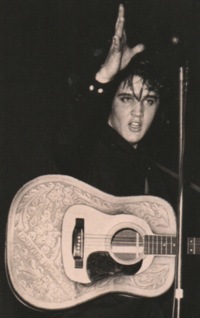 Over the next month, both recordings climbed up the list, with “Hound Dog” leading the way. On September 8 it was at #2, with “Don’t Be Cruel” right behind at #3. That week “My Prayer” by The Platters was #1. Then, on the September 15 chart, “Don’t Be Cruel” jumped over “Hound Dog” and took over the top spot, where it remained for seven consecutive weeks. Meanwhile, on October 6 “Hound Dog” moved up to #2, giving Elvis an unbeatable chart record of having the two sides of the same single release in the top two spots of Billboard's chart. 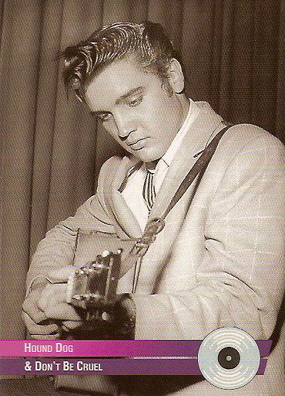 The two back-to-back Presley recordings eventually spent an incredible 10 weeks together in the chart’s top 10. On October 31, 1956, Variety reported that “Don’t Be Cruel” had already topped 3,000,000 in sales and was still going strong at more than 50,000 per week. Finally, on November 3, Jim Lowe’s “The Green Door” toppled “Don’t Be Cruel” from the top spot. 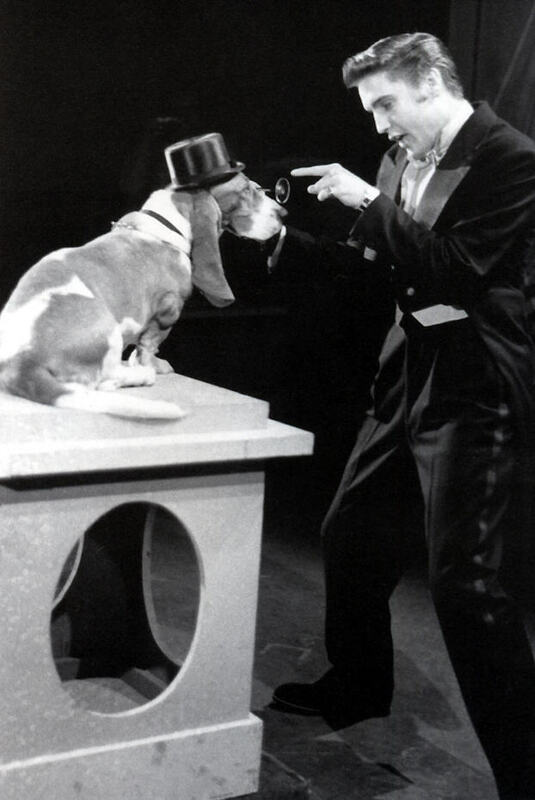 That same week, “Hound Dog,” which had been kept out of the #1 spot by its own flip side, dropped down to #12 after an 11-week run in the top 10. Both recordings remained in Top 100 for many more weeks. “Don’t Be Cruel” didn’t drop off the chart until February 16, 1957. “Hound Dog” initially left the chart on January 26, 1957, but a week later showed up again at #85. It seemingly dropped off the chart for good on February 9, but then, five months later, on July 1, 1957, “Hound Dog” inexplicably reappeared on the Top 100 for two more weeks. Overall, “Hound Dog” spent 28 weeks on the Top 100 (second only in Presley chart history to “All Shook Up’s” 30 weeks), while “Don’t Be Cruel” lasted for 27 weeks. As was common in the music business in those days, the phenomenal success of “Hound Dog” and “Don’t Be Cruel” resulted in lawsuits. The first battle for publishing rights came in mid-October 1956, when Valjio Music brought suit against “Hound Dog” writers Mike Stoller and Jerry Lieber and Presley’s publishing company. "No other artist in the rock era, not even The Beatles, had a double-sided hit that could challenge the cumulative chart performance of 'Hound Dog' and 'Don’t Be Cruel.'"